Driveways and garage floors are surfaces that are meant to accommodate vehicles, whether running or parked. It is important for residential and commercial floor owners to know that most tires are likely to leave tire mark stains on floors that have been painted, stained, or applied with a synthetic material, like a sealer. Contrary to belief, tire marks are not caused by dirty or greasy tires. Instead, it is caused by a tire ingredient called plasticizer. Phthalates is a group of chemicals that are usually added to plastic and rubber products as a plasticizer, making plastic and rubber products softer and more flexible. Although this is quite beneficial in the performance of rubber tires, it has been recently banned by the Environmental Protection Agency (EPA) because of its adverse effects on the environment. How Does it Cause Tire Marks? Tires get heated as the vehicle runs. As soon as the hot tire comes in contact with a sealed driveway or garage floor, plasticizers start to seep into the sealer, causing it to discolor. Plasticizers are not bound chemically to the rubber material of tires. Instead, it is entangled into the material making it inclined to leach when exposed to heat. The discoloration happens immediately which is why tire marks appear instantly after a car drives away. How to Prevent Tire Marks? Changing the type of tires a vehicle has is possible but not highly-recommended because it is costly. Besides, most brands still use rubber tires with plasticizers in it while the search for a more environment-friendly alternative is ongoing. The best solution thus far is to change the sealer used on a driveway or garage floor. The denser the sealant, the less likely it is to be stained. Epoxy and Polyurea Polyaspartic coatings are highly recommended for floors exposed to vehicular traffic because of its dense nature. To minimize the occurrence of staining caused by plasticizers, a material with low thermal conductivity can be placed between the tire and the epoxy sealed garage floor. Materials such as jute can slow down the transfer of heat, thus, reducing the risk of sealer discoloration. 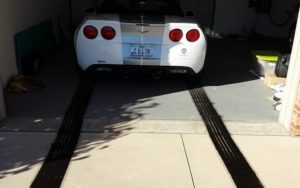 For existing tire marks, address it as soon as it happens if at all possible. A concrete degreaser can be used to lighten, if not remove, tire marks. For deeper discoloration, it is highly recommended to consult a professional concrete contractor to know if a resealing is necessary.